Dining Dish: Is This What A Reality Show Feels Like? I attended the IACP (International Association of Culinary Professionals) conference in Chicago in April. I want to share an experience I had and hope you enjoy reading it as much as I had participating. I'm up early, pumped to be participating in a workshop for food photographers and food stylists. I hopped on the bus taking us to Stephen Hamilton Photographics, our host studio for the day. You need to go to Stephen’s link not just to see his photographs but to see his studio – two full kitchens plus a small side kitchen, a room the size of my living and dining room filled with china, glassware and flatware (a dream for a plate junkie like me)…. this was big time. I am not going to bore you with the panel discussion; it was pertinent to those in the room. What I am going to tell you about is the “challenge” set forth to the 40 stylists and photographers. Don Odiorne, a vice president at the Idaho Potato Commission presented the challenge of re-creating Tater Tots and having a completed photograph to go along with the campaign. No choosing teams, they were pre-arranged. We had about 30 minutes prior to lunch, plus lunch to come up with a concept. Ten strangers, ten different ideas that had to be narrowed to one concept, cooked, styled, and photographed in three hours. As for my team, Team Red, we had photographers, a chef, and a representative from a manufacturer (I think), add me and a bright, vibrant stylist-chef, Danni Bleil to the mix and that was our team. My thoughts were, you liked Tater Tots as child, you’ll love them as an adult-reinventing them for an adult market. 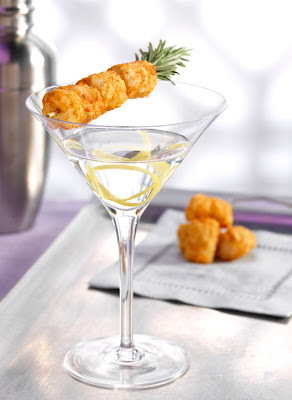 Danni had the idea take-off on the mashed potato martini bars and after what was a very, very, long, tedious discussion we came up with an adult drink concept with the Tater Tot garnish. By the time we went to the kitchen/studio I had become team leader (I got to make the presentation) and Danni was lead on the styling. Let me say here and now, my styling skills have been for live cooking demonstrations and TV segments. I took the workshop to learn more about photographic styling. Danni showed me a fabulous mini photo album of beverages taken by Steve Adams , a photographer on our team. We immediately made him lead photographer. The team spent a lot of time coming to an agreement on a concept which left us last-in-line at the prop room. Then there was a problem with the camera/computer set up. If this kept up, as team leader, I knew Donald Trump would fire me in the board room. To keep the odds even for each team, each were presented with identical food baskets. I’m trying to remember every teams work. One does sticks out, it was a Tater Tot baked with a Rolo (chocolate – caramel candy) on top - need I say more. One team made it mini foods by cutting the Tater Tot in half and making mini-burgers and the other team dressed them up for hors d’oeuvres. Another team leader put together a PowerPoint presentation. I was in spasms about memorizing the presentation, at my age I’m lucky to remember why I walked into the next room. When I was advised I didn’t have to memorize it and could use notes, I was golden. Team Red really pulled together after a very rocky start. Danni came up with the name, Tatertini, and I used my public relations/marketing skills to drive the team story home of opportunities in the adult market, co-branding with potato vodka companies, creating a signature drink that will boost sales and expand the advertising market to magazines like Gourmet, Bon Appetit and Santé. Steve Adams addressed how he photographed the product and we presented the photograph in color and in black and white. Reality, what can I say – IT WAS A BLAST!